Following the official opening of parliament by Queen Elizabeth, thousands of protesters are gathering in Westminster to oppose further austerity and plans to repeal the Human Rights Act. There may be strong language in this video. RT is wrapping up its End Austerity Now live updates. 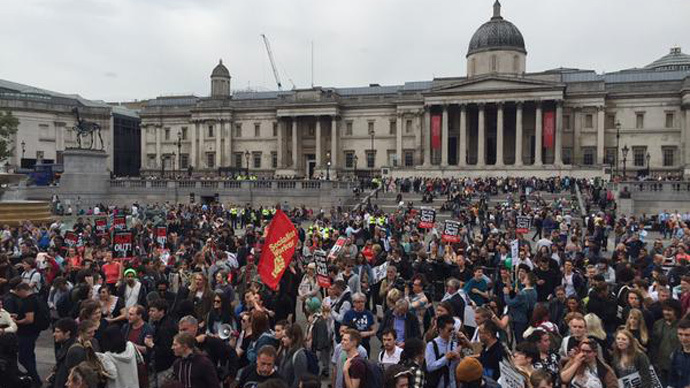 An anti-austerity Twitter feed has criticised the BBC for its poor coverage of nationwide protests. Some protesters are returning to Downing Street, according to Siobhan Robbins at Sky News. Police block a road in Liverpool in a bid to stop the anti-austerity march there. Protesters are now marching down Oxford Street, according to reports. Labour MP and former minister Diane Abbot has expressed solidarity with protesters marching against austerity. RT's Laura Burdon-Manley reports traffic is being brought to a standstill as protestors stage a sit-in. Violent clashes have broken out between protesters and police outside a house where an eviction is purpoted to be taking place. Protesters are clashing with police outside a house, where they are attempting to stop an eviction. Green Party leader Natalie Bennett also spoke to protesters outside Downing Street.